Mitch Storar is a medical student at Ohio University. His work has appeared in Jelly Bucket, Weave, Fugue, and several other publications. He lives outside of Athens with his wife, Sarah, and daughter, Morgan. 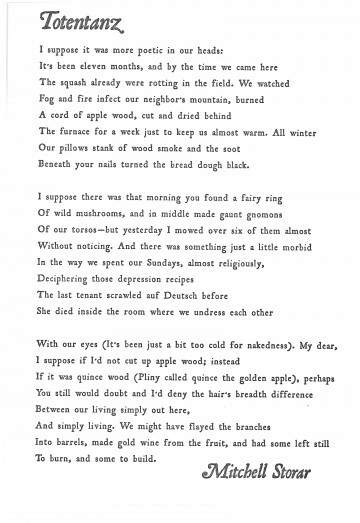 William Blake, in his Songs of Innocence and Experience, uses parallel poems to compare two views of the same subject: one ideal and one fallen. But Storar knows these two states exist simultaneously in our minds. We vacillate between perfect ideas and their flawed reality. “I suppose it was more poetic in our heads,” the speaker says of “living simply,” and the realities of wood-burning heat certainly wore the couple down. What hints of joy there are (homemade bread, playing sundial in the middle of a fairy ring) quickly fall apart. Beautiful ideas keep appearing (fruit, gold wine) but they’re never realized. Instead they hang at the poem’s end, just a glimpse of something better amid the disappointment. What life there is in the place of this poem (a cabin? and old farmhouse?) is the life associated with decay: mushrooms, a garden gone to seed, nearby fire. But the place still stands and the couple persist awhile, so the typeface needed to reflect that weathered state. Dieter Steffmann’s Roman Antique is mostly there, but its edges waver, as if once crisp letterforms can no longer hold the line against encroaching white space.